#FarpointCon2020 Hotel Block is Open! The Delta Hotel by Marriott has opened room reservations for #FarpointCon2020, scheduled for February 21-23, 2020! The $125/night rate (before local taxes) is the same as the last two years and is available from Monday, February 17th through Thursday, February 27th. Take advantage of your stay to spend extra time with friends and to explore all the Baltimore/Washington area has to offer! The room block closes for reservations Monday, January 20, 2020. We are happy to announce that our contract for Farpoint Convention 27 has been signed with the Delta Hotel by Marriott Hunt Valley, MD and #FarpointCon2020 will be held February 21 – 23, 2020! And for even more good news, our contract with the hotel allows us to offer sleeping room rates at the SAME price as 2018 and 2019 – $125/night before tax! The link to reserve your room will be posted shortly. Pre-registration for #FarpointCon2020 will open in April 2019 after our budget is approved. We are already looking at potential guests for next year. If you have any thoughts, please send them to us at contact@farpointcon.com. Make sure to bookmark this website, and follow us on Facebook (Farpoint Convention) and Twitter (@FarpointCon) to receive updates as they are published. Here is updated information on autographs and photos with our guests. Don’t forget that you receive 1 complimentary signature from the guest of your choice Saturday and Sunday on an item from your personal collection your present to be signed or the convention program book. Your convention membership badge will be punched when you redeem your complimentary signature. This benefit gives 3-day members 2 complimentary signatures over the weekend and day members 1 on the day they attend the convention (Saturday and Sunday – GUESTS ARE NOT SIGNING ON FRIDAY). The prices below are for any purchased signatures and at the table photos/selfies. Farpoint does not offer professional photo ops. Planned signing times will be posted in advance and on signs at the signing stations, which are located on the lower floor of the hotel convention center in the Hunt/Valley ballroom hallway. Purchases of autographs and photos are cash only. It’s that time of year for news about some of the fun coming up in February 2019! We know many of you start now planning for the con – creating your costume(s), learning a new game to share, studying for a panel or presentation and/or snagging that great something to be autographed by a celebrity guest. In that spirit, we present a sneak preview of #FarpointCon2019 to help you prepare for the fun. You can register online through our website www.FarpointCon.com. The deadline for pre-registration is January 31, 2019. You can book your hotel rooms through the dedicated link found at http://www.farpointcon.com/hotel-information/. The deadline for our hotel room block is January 10, 2019. We encourage you to continue checking our website and/or follow us online at Farpoint Convention on Facebook and @FarpointCon on Twitter and Instagram for the latest news. You can post comments and questions here or on our Farpoint Convention 26 Facebook event page about particular events and/or to look for ride and room shares. 1. Celebrity Guests: Current plans are for Wallace Shawn and Maurice LaMarche to arrive on Friday in time for the Cocktail Party and Opening Ceremonies while Rob Paulsen will be arriving very late Friday/early Saturday after an evening performance engagement. Prometheus Radio Theatre is preparing another fun show for our Opening Ceremonies and we all hope Wallace and Maurice will approve the script and participate. We will let you know more as things develop. All 3 of our celebrity guests will be speaking from our main stage on both Saturday and Sunday. Don’t forget that your weekend, Saturday and Sunday convention membership ticket includes one complementary signature from the celebrity guest of your choice each day! The guest will sign either the convention program book or a photo/item from your personal collection you present to be signed and your convention membership badge will be punched when you redeem your signature. Signed photos and items available at the guest’s signing station and at-the-table selfies must be purchased on-site (cash only). You can redeem your complimentary signature and purchase other items in the same visit to the guest’s signing station. 2. Authors, Books, Reading & Writing: Many panels are being prepared for this track covering topics that support professional writers, help new pros break into the field, showcase new work from our author guests and give readers the opportunity to share their love of their favorite books and stories. Our author guests will sign copies of their books from your personal collection at no charge during our Book Fair Friday evening and will have copies of new and other works available for purchase at the same time. Several of our author guests will be premiering new books at Farpoint during the Book Fair; make sure to look for the specially-marked tables identifying the titles that are premiering! Many of our authors are participating in the 2nd annual Short Story contest. Make sure to stop by the voting station to check out this year’s entries and vote for your favorite. Our free “All Kinds of Writing Workshop” returns to help writers at all levels (including aspiring) in honing their abilities and increasing their knowledge. Veteran writers Howard Weinstein, Bob Greenberger, Dave Galanter, Kelly Meding, Kelli Fitzpatrick & Bob Jones will answer all your questions on the craft and business of writing, focusing on as many puzzle pieces of fiction and non-fiction storytelling as can be squeezed into 2 hours, including characters, plot, structure, humor, tension, theme, and more — so bring your best, most-vexing questions to discuss with our team of pros! 3. New Media: The New Media program track covers newly emerging technology of all kinds. Presenters in this track include independent filmmakers, publishers, comic artists, podcasters and online content creators. This year’s panels will include “Using Social Media Effectively”, “From Idea to Execution – A Crash Course on Bringing Your Indy Project To Life” and “Storytelling with New Technology”. Several independent films will be shown throughout the weekend, including the Harlan Ellison documentary from 2008 “Dreams With Sharp Teeth”, presented with permission by his estate. 4. Movies and TV: There will be panels galore looking at the wealth of films and shows of interest to geeks, nerds and science fiction fans! Panel topics for 2019 include “Voltron on Netflix”, “The Future of Superhero Movies”, and “The Star Wars Multiverse”. And that’s just a small sampling as you can expect talks covering Star Trek, The Orville, Outlander, Harry Potter, the Marvel and DC cinematic universes and much more! 5. Youth and Children: We are looking forward to some wonderful activities geared toward our younger fan audience, many of which can be enjoyed by fans of all ages. Our regular Friday night pajama party is returning where younger fans can enjoy snacks, stories, crafts and a movie if that is more to their interest than our Cocktail Party and Opening Ceremonies. There will be hands on make and take activities on Saturday and Sunday for our youngest fans. Teens interested in writing are encouraged to talk with some of our pro author guests during the “All Kinds of Writing Workshop” on Saturday morning, and those interested in art careers can attend one of the several hands-on classes being offered by Art Way Alliance throughout the weekend. Our Game Room is open into the wee hours of Saturday and Sunday morning and offers games and crafts for all ages, interests and abilities. Our friends from the Wizarding Alliance of Non-Lethal Duelists (W.A.N.D.S.) return again with their latest beta test for the Wizard Dueling LARP suitable for any fan able to hold a wand. And, of course, our Masquerade Costume Contest will be held Saturday night in the ballroom, open to all ages, costume categories and maker abilities. There will also be several panels of interest to fans of all ages in our Movies/TV and Costuming/Cosplay tracks and we encourage our young fans to join in and share their knowledge and points of view. 6. Science: The 2019 Science track offers looks at Mars exploration and astronomy, including “SpaceX and NASA — better together for getting to Mars” and “DART: NASA’s First Mission to Test Planetary Defense via Asteroid Deflection”. Our science track features speakers from NASA and scientists from several of our local universities who generously share the latest knowledge from their fields of expertise. 7. Costuming and Cosplay: We are very excited to announce that this track is expanding for 2019 in response to the requests from attendees and the enthusiasm of the fan community for costuming and cosplay. Topics in this track reflect the wide array of interests in the community of costumers and cosplayers: “Cosplay For A Cause”, “Kids and Cosplay”, and “Crafty Costuming” are only a few of the talks and activities coming in February. A very exciting new addition to this track is the NEW Stuffed Animal Cosplay Contest! Everyone is encouraged to bring their favorite costumed friend from home and show them off during the contest. This is an all ages event and we’d love to see how fans of all ages include their “pets” in their fan interests. 8. Live Events: And we’re saving one of the best and biggest announcements for our last paragraph. Farpoint 2019 will be staging our first ever ESCAPE ROOM activity as part of our Live Events track! “Escape From Mars” is a puzzle-based Escape Room suitable for teams of 2-8 people of all ages. Take your best shot at getting back home after being stranded on the Red Planet! There will be several opportunities to flex, dance and move as part of Farpoint 2019’s Live Events! There will be a workshop called “Let’s Dance” where you can learn some of the dances from the musical episodes of several fan-favorite series. Keith RA DeCandido will be presenting a Self-Defense Workshop teaching teens and adults how to protect themselves in uncertain situations. And our friends from Maryland Kunst des Fechtens return with hands-on classes in European style swordfighting. We welcome returning guests The Boogie Knights, Luna-C and The Chromatics who will be performing live on our main stage during the weekend. There will also be a new game show called “Cash Con” based on the popular “Cash Cab”. Come show your knowledge and win some prizes! 9. Charity Auction: We will once again be raising money for our official charities, the Julien Fleming Memorial Fund (www.jfmf.org) and Art Way Alliance (www.artwayalliance.org). Short live auctions are scheduled for Friday evening during the Opening Ceremonies and Saturday evening at the Masquerade costume contest halftime, with a silent auction taking place all weekend at the charity auction display in the Art Show. Previews of items available for auction will be posted online in the weeks leading up to the convention. Our charity partners send their thanks and appreciation for your continued support. All of this fun and much more (200+ hours worth!) awaits you at Farpoint 2019. We hope to see you there! You can register online through our website www.FarpointCon.com. We encourage you to continue checking our website and/or follow us online at Farpoint Convention on Facebook and @FarpointCon on Twitter and Instagram for the latest news and to view our schedule when it is released 2 weeks before the convention. Thank you as always for your continued support of your local fan-run conventions! What a life Marvel legend Stan Lee lived! A son, brother, husband, father, creator, veteran…… and just a great person. His creativity has touched so many lives. Not just a large percentage of people in America but a large percentage of people in the entire world. You could travel to China wearing a Marvel character shirt, meet someone who has either read the same comic or watched the same movie, and become instant friends regardless of any cultural or language barriers. 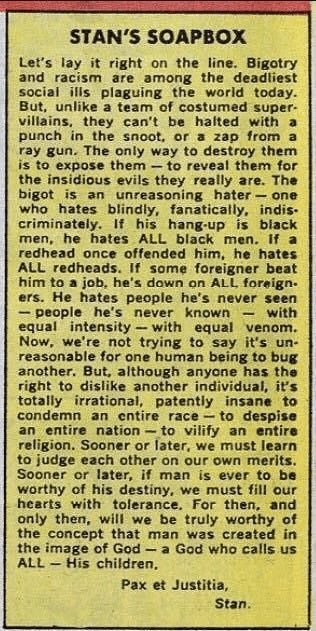 Stan Lee believed every person had the strength within them to do the right thing. He regularly used his characters and stories to highlight society’s issues and help us find a better way. Our world is a better place because Stan Lee was in it and we’re now poorer having lost him. Excelsior, Stan – onward and upward. May we all be the real superheroes, holding down the fort now that you’ve joined your beloved Joanie. Thanks for all the fun.